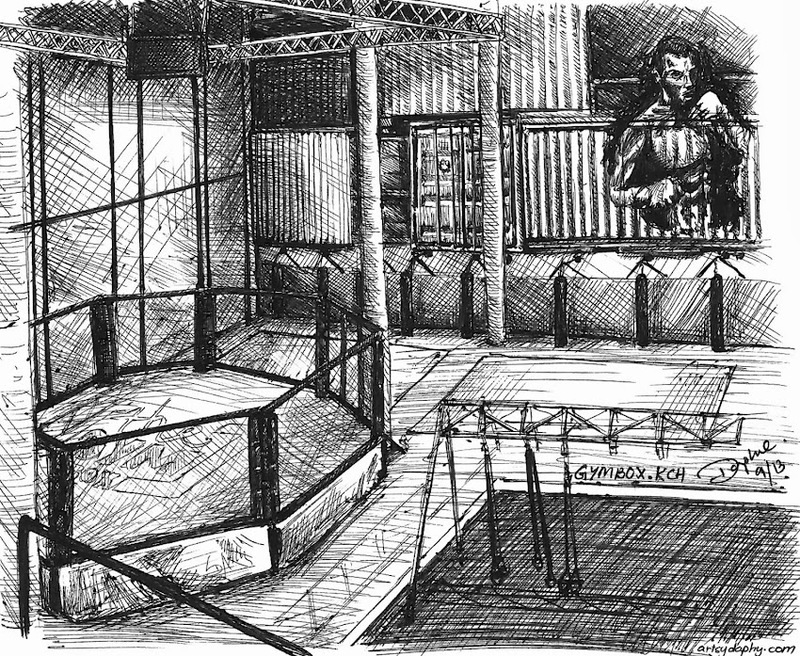 A ball point pen A5 sketch of where I go to 3-4 times a week after work! The Gym Box, first mixed martial arts gym in Kuching, Sarawak. They import trainers from around the world to coach the MMA, Muay Thai, Jiu Jitsu, and Boxing classes. They also have a full range of gym facilities and offer a wide range of classes apart from the Fight Club like Zumba, Yoga, Pilates, TRX, Body Pump, Body Combat, Hip Hop, and so on. Check out their Facebook Page for more info. Picked up Muay Thai and MMA here and got my overall fitness back on track. Quite glad to have joined. It’s the last quarter of 2013, been through tons of changes this year and accomplished a few things. Life’s all good now but there’s one major thing left on my list to do, apart from posting a hundred drawings this year (till this current post there’s only 56). Three more months to go to achieve them! Have you all done what you’ve all set out to do this year?